Trada Casino will then reward you with a bonus (Welcome Bonus is for new players only). The terms and conditions of the bonuses vary between different casinos and might also change over time and between different countries, so it is important to compare the different offers and read the T&C for Trada Casino before signing up. 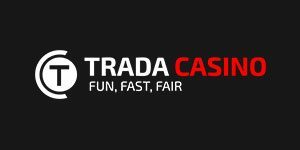 Owned by Trada Games Isle of Man Ltd, Trada is a UK Gambling Commission regulated casino that operates under a tag line “Fan, Fast, Fair”. The three principles are obviously taken seriously, as the casino is increasing in popularity since it was first launched in 2011, leaving a trail of content visitors. Thanks to the browser play and mobile device friendly design, Trada is easily accessible to all the players who prefer gambling on the go, with a few location restrictions – the full list of accepted countries is available on the casino website, on the drop down registration form menu. Great selection of releases provided by the industry’s finest software developers is not the only advantage of Trada. The casino also provides a clean looking and an easy to navigate platform which allows the users to filter the offer according to the name of the provider or the gaming category. In addition to that, new members will be welcomed by a rich promotional program, while the customer support is provided by an award winning team of agents, available via email and Live Chat. The offer at Trada really is overwhelming and the best way to browse for games is to use the available filters, which can be done according to the game type and the gaming company: NetEnt, Quickspin, Microgaming, Pragmatic Play, PariPlay, WMS, Playson, iSoftbet and 1×2 Gaming. The three main categories are Slots, Table Games and Live Casino. The first two categories allow the visitors to play as guests in demo, while accessing Live Casino tables will require a registration process to be completed. This is the category where the majority of Trada gaming offer is located and unfortunately, there are no additional subcategories that would allow narrowing the search down to a particular theme, number of paylines, release date or a jackpot. There is however an option to only list the games by a certain gaming company or check out what are the most popular slots under Featured, which is where Raging Rino, Aloha Cluster Pays, The Legend of Shangri La Cluster Pays, Starburst, Twin Spin, Montezuma and plenty of other extremely popular slots can be found. Usually, any game that cannot be sorted under the main categories has its own group that you go to when you would like to play Keno, Scratch Cards or Bingo. This is not the case with Trada, although Keno and Bingo games can be found on the site, using the search bar option. Evolution Gaming is the provider of the Trada casino’s Live tables, which means that you can expect a wide range of table games, hosted by professional dealers and streamed in HD video quality. For easier navigation, each of the games has its own separate lobby – Blackjack, Roulette, Baccarat and Poker – and one will get to see the information on the table limits displayed on the game preview screen, even before joining the table. 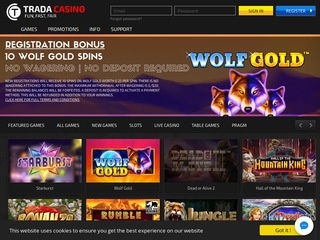 As a browser type casino, Trada does require any downloads or live casino package installations and a seat at a live dealer table will be waiting for you as soon as you open your account and submit a deposit. There are a lot of options that you can use to submit your deposit, most popular being credit and debit cards like Visa, Maestro, MasterCard, together with other forms of electronic payment methods – Skrill, Neteller, Paysafecard, Trustly, Sofort, iDeal, AstroPay, DineroMail, Boleto, Giropay, Ecopayz, Lobanet, Euteller, Qiwi, Neosurf, Usemybank and a few others. The deposit range is $5 – $2,000 but the amount can be customised by the player – same as the withdrawal amount, which starts at $10 and goes up to $10,000. The processing time is 0 to 6 hours and it takes approximately 1 to 5 working days for the money to clear. All the sensitive details and payment information are protected and Trada uses 3D safety measure to ensure that all transfers are handled in a secure environment. The service at Trada casino is rated as exceptional and their Live Chat operators will make sure your every concern is handled with care and attention you deserve as an account holder or a potential casino member. Outside business hours (9am to 11pm BST/GMT time), you are welcome to send an email or visit their complaints page. If you are a traditionalist, writing a letter and mailing it to the casino is also an option – you can find the mailing address under the Support tab. There are no active phone lines at present time.